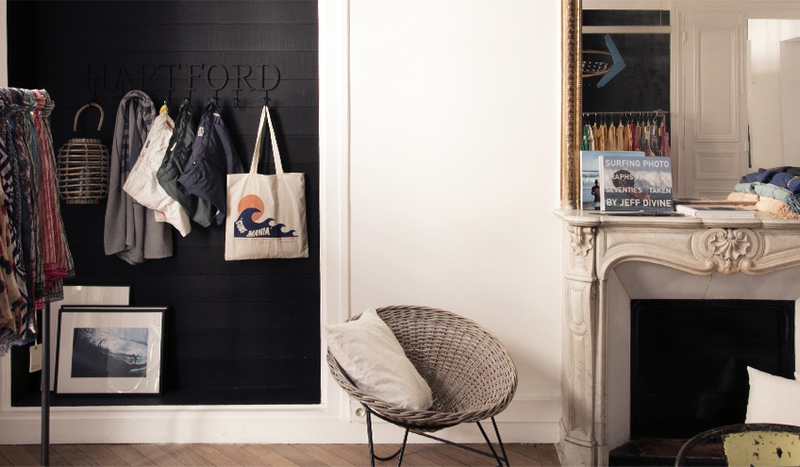 The Hartford showroom is situated in an old police station in the 11th district of Paris, where the assassination of Jean Jaurès took place. 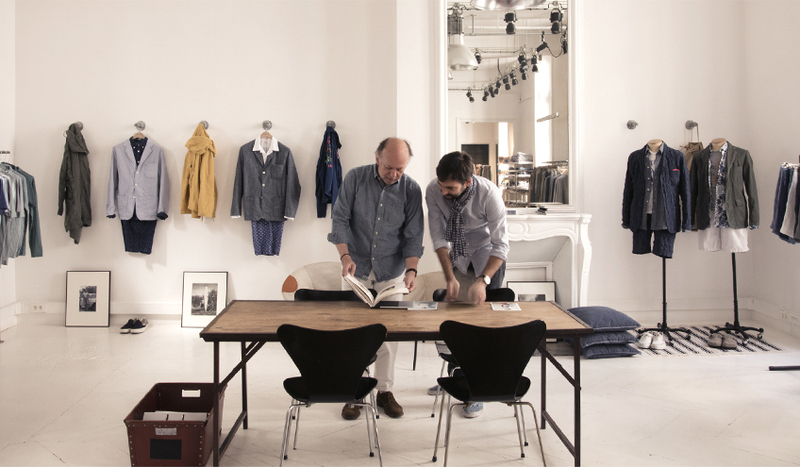 A story that interests Yves Chareton, the quiet and welcoming founder of this French brand created in America in 1979. Vintage shirts, influenced by the military, and West Coast inspired prints form Hartford’s identity. Blue cotton chambray provides the background for this, along with Vahines, palm trees and surfboards, as well as many other nods to his hometown, Hossegor in southwestern France, and his passion for the US. 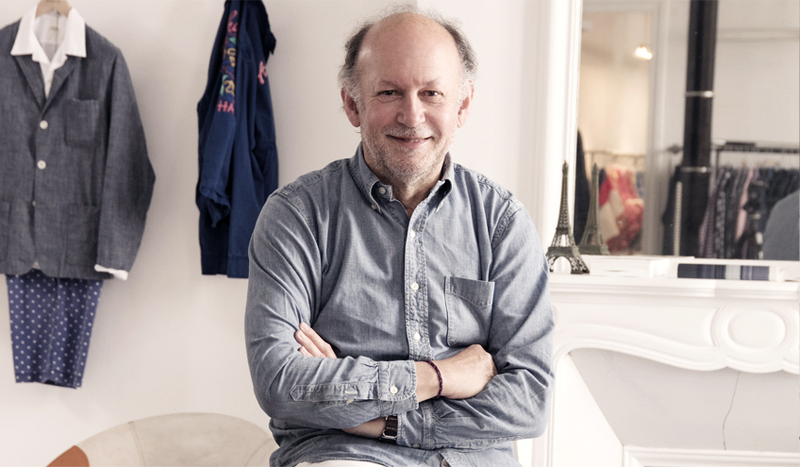 Yves, along with Marinia and Yann – his two children with whom he works – create collections for men, women and children all with the same style; casual, as if coming straight from the beach, all while remaining completely elegant. Where did you get the idea to create your brand? After graduating from business studies, I worked in a New York bank. One day, while having a chat with a friend over some drinks, we came up with the idea. At the beginning, we weren’t particularly looking to achieve a lot from it. We simply wanted to dress in American style clothing, which could only be found at flea markets in the outskirts of Paris. What we liked about these clothes was the materials, the shape of the shirt collars and the military inspiration. For us, El Dorado was what came from the US. We wanted to live our American dream! When looking for fabrics, we met a wonderful man in Brooks who gave us an address. We went there and they understood straight away what we were looking for. It was perfect for our project. We were shown their stock of fabrics and asked if that was what we were looking for. We felt as though we’d discovered Aladdin’s Cave. From the get go, the brand wasn’t created for Americans but for Europeans. At that time, friends were starting to open up alternative boutiques in Paris, like Globe, which sold Heinz t-shirts, 501 vintage and skateboards. It was exactly what we needed. This was our first point of sale. We took part in a salon in France in order to make ourselves known and saw an immediate success. Everything was made in the US, and the company was based there too. Then in 1982, the value of the dollar shot up, so it became impossible to sell in Europe. This was the moment we decided to take the company back to France. How can you explain its immediate success? It worked straight away in France, but the Americans weren’t interested at all in the beginning. Then, we became known in Italy and Spain. We started to create swimsuits almost at the same time as shirts and wetsuits. No one sold this type of product, apart from a few American items imported to Biarritz. We’re originally from Hossegor in southwestern France, so we were familiar with beach life and surfing, and it was natural for us to create swimsuits. Ultimately, the thing that worked best was that we created items for ourselves. Yes, that’s true. In the early 90’s, Bruce Springsteen went into one of our points of sale in Los Angeles and bought a black linen shirt. He came back the next day and said “This is awesome. This is what I want for my next tour! I need 50.” This gave us incredible publicity. And today, we’ve noticed that one of our best clients on our e-commerce site is Eric Clapton. He buys a good part of the collection, almost every week. He’s quite low-profile so we don’t contact him, we don’t want to bother him. But it’s pretty funny. I’m a guitarist so, obviously, this is a pretty big deal for me. How would you define the brand’s DNA? I’d say that it’s casual contemporary, with a strong focus on materials – all of which we choose ourselves. They’re almost all selected from Italy, France and England. We’re conscious of the origins of our materials and the selection of ateliers that we work with, like Liberty or Albini, which is maybe the most beautiful cotton company in Italy. We work a lot with natural fibres; cotton, linen, wool and cashmere, and a lot of chambray and oxford cotton for our shirts. The prints are also extremely important. 90% of our fabrics are exclusive, you won’t find the same print from one collection to the next, except for the liberty print which is unique. We have flagship products, which we evolve over time, and favourite colours like blue and khaki. This year for example, we went with the Riviera theme. The prints were hand painted by our illustrators. We always have an illustrator working with us full time to work on our prints, which are all exclusive. We can also be inspired by a work of art or by a drawing or photo. Then, we work on our themes. How did the women’s and children’s lines come about? For a long time, we made womenswear to order for certain clients. So, we decided that we absolutely had to develop it and, today, the women’s collection is a very important part of the company. 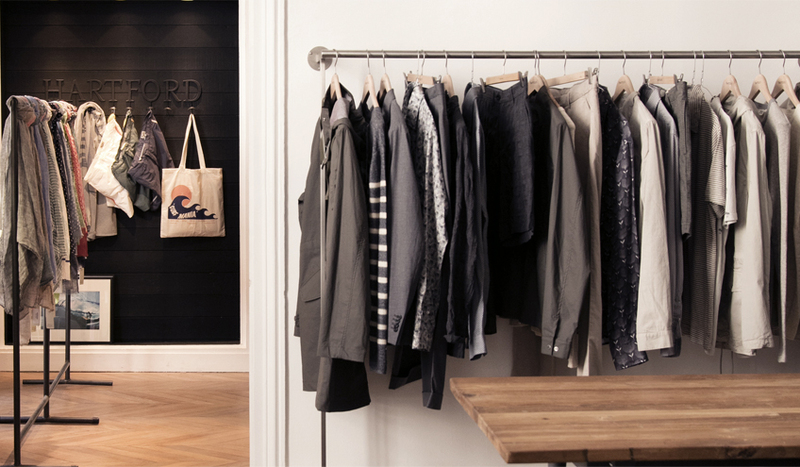 Our turnover is 45% menswear, 45% womenswear and 10% children’s wear. The children’s line came later, in 2007. This was also in high demand. And for a long time, we collaborated with Bonpoint, creating swimsuits and linen shirts for them. This also worked very well and so we decided we had to develop it. Your daughter, Marina, manages the women’s style office and your son, Yann, is in charge of e-commerce. Is Hartford above all a family affair? Absolutely. But they were the ones who decided, after other professional experiences, to join me. I didn’t asked them to, they had to want to do it themselves. How would you define your children’s range? The idea is really to take elements from the adult collection and to adapt them to suit children. It’s made up of pretty colours and pretty materials that are comfortable to wear, without being too over the top. When we think about our children’s collections, we keep 10-16 year olds in mind, even if the clothes start from 2 years old. It’s difficult because teens have a very specific style. What are your must-have pieces? In a child’s wardrobe, you find t-shirts, sweatshirts, polos, knits, shorts and swimsuits. What works best in our children’s collections are prints, above all, nautical prints. We can’t always use the exact same prints for children as for adults, so we create a few specifically for this range. The next collection, for example, is based a lot around surfers and vahines. It could be called “First trip to Hawaii”, it’s about a child who is very lucky and discovers Hawaii for the first time (smiles). 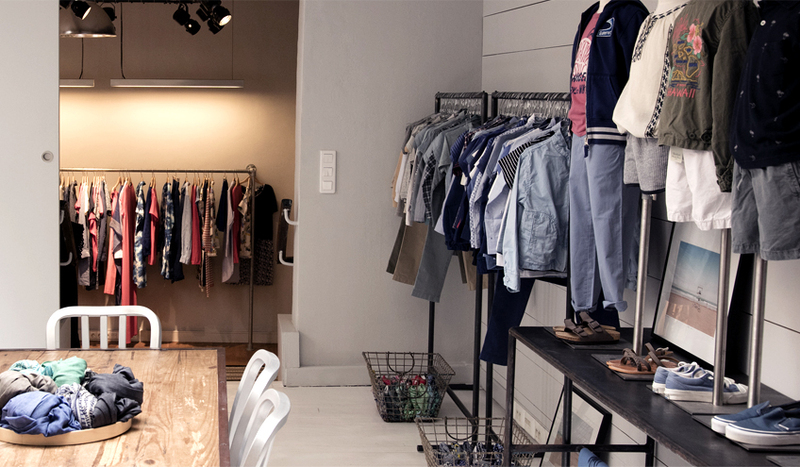 You have three boutiques at Place des Victoires in Paris and your showroom isn’t far from there. What are your favourite places to visit in this area? The Moulin de la Vierge café, it’s pretty much our HQ. The taxidermist on rue d’Aboukir is also extraordinary. And in the Véro-Dodat gallery, just a hop, skip and a jump away from Palais Royal, you can find the best vintage guitar shop. What is the Hardtford Motto? Click here to see 219 more products that match your search in the outlet section.